Explanation: How did this huge cyclone form? An unusually strong storm -- perhaps the strongest storm in the recorded history of the South Atlantic Ocean -- crossed the coast of Brazil last week. 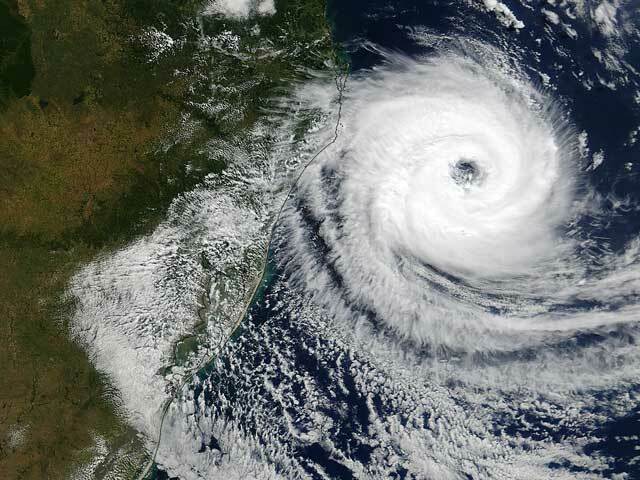 Cyclones this powerful, classified by some as the first ever Category 1 Hurricane, are very rare in the South Atlantic. Tropical cyclones are large regions of low pressure with little vertical wind shear that typically form over regions of warm water, which power the cyclone through evaporation. Reports of relatively cold air in the center indicate, however, that this storm was extratropical. The storm was dubbed Caterina by local meteorologists, although no formal naming precedents exist in this part of the world.